Smartphone owners, what is the first thing you do when you wake up in the morning? For me, (after snoozing for the nth time) it’s dismissing the alarm on my phone and launching an RSS feed reader to check up on what’s happening in the world*. Well, what if I told you that you could combine the alarm and RSS feeds? A recently released app called RSS Alarm does exactly that. Check it out after the jump. 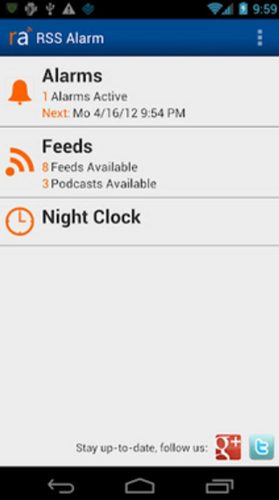 The app’s main menu consists of three items: Alarms, Feeds and a Night Clock. You can create traditional alarms that only rings at a certain set time, or attach it to your RSS feed or a subscribed podcast. Night Clock is a simple clock that displays the time on your device’s display. Feeds are RSS Alarm’s strongest feature: from this menu, you can set up which RSS feeds to subscribe to so that they are read out to you in the morning with the alarm. Google Reader fans will be glad to know that RSS Alarm allows importing RSS feeds from Google Reader (press Menu > Import), so the initial set up will be quite easy. You can also import podcasts from your device’s /Podcasts directory or from Google Listen. Once everything is set, RSS Alarm will start reading out your RSS feeds (using Android’s built-in text-to-speech technology) or playing your set podcast in the morning. While I’m not completely sold out on the idea of combining my alarm with an RSS feed (A dedicated RSS feed reader, in my humble opinion, is a much better way to follow news when you wake up in the morning), I really liked RSS Alarm’s easy to use Ice Cream Sandwich-compatible user-interface and how it made me feel like Tony Stark from the Ironman series. 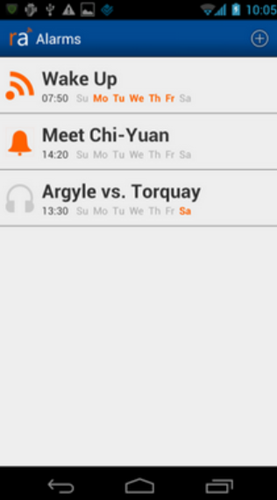 RSS Alarm is available in two versions: a free, ad-supported version [Google Play] and paid [Google Play] version that removes ads and adds a Shake to Snooze feature. Even if you don’t like the idea of combining alarms with RSS feeds, it’s worth giving RSS Alarm’s lite version a try. You have nothing to lose, right? Don’t forget to let us know what you think of RSS Alarm by leaving a comment over on Facebook and Google+ page! *I have a hard time explaining this to my relatives, but going through an RSS reader is the 21st century equivalent of reading the morning newspaper in bed.